Keen amateur astronomer Harry Fontaine caused a stir amongst both amateur and professional colleagues alike when he announced that he had observed strange and inexplicable anomalies in the motion of the planet Mars. "It was about 7.30pm yesterday," Harry explained. "I was watching the planet from my bedroom window. Suddenly I saw it get on a bus and go into town. I remember thinking to myself, 'That's funny. It usually stays in on a Wednesday night.'" 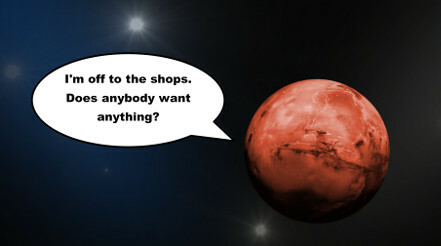 If Harry's sighting is confirmed it means scientists will have to completely rethink their ideas about what Mars does for fun in the evenings.